World Jewish Congress (WJC) President Ronald S. Lauder on Thursday called on Texas A&M University in College Station to insist on the cancelation of an event with Richard Spencer, a leader of the so-called ‘alt-right’ movement in the United States, on its campus. “This man is one of the worst hatemongers in America, and his white supremacist and other bigoted ideas are sickening. I urge the university to deny him access to any facilities on campus,” he said. Lauder also welcomed President-elect Donald Trump’s condemnation and disavowal of the ‘alt-right’ movement. “Racists, anti-Semites and preachers of hate such as these are the enemies of democracy, and it is incumbent on all of us to fight them,” declared Lauder. Richard Spencer is a leading voice of the extremist alt-right movement in the US who has a long history of white supremacist, anti-Semitic and other racist statements. He is scheduled to speak at a private event in an A&M university auditorium, though the invitation was not issued by the university itself. 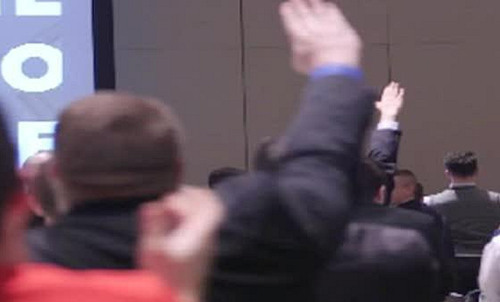 Only a few days ago, Spencer and his supporters were seen on video giving Nazi-style salutes (see screenshot) during a highly publicized meeting in Washington, DC.